As globalization draws countries closer, the Commonwealth of Independent States (CIS) is building on its regional unity to strengthen governance in its member countries. 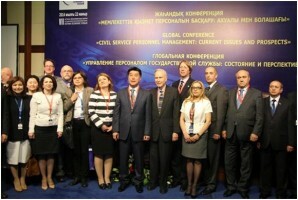 Members of the CIS as well as Georgia, Afghanistan and Mongolia came together to participate in the Regional Hub for Civil Service (Hub) based in Astana, Kazakhstan. The Hub has more than 30 participating countries and five international organizations. It was initiated through a joint project between the United Nations Development Programme and the Agency for Civil Service Affairs of the Republic of Kazakhstan. The mission of the Hub is “to contribute to the development of effective systems of civil service” throughout the region. To do this, participating countries have adopted a three-pronged approach. The Hub has developed working groups focused on training and research; knowledge management and expert networks; and partnership and experience exchanges. These goals are executed through a number of initiatives including an international conference and a journal. ASPA member Rex Facer, Past ASPA President Chester Newland and attendees at the 2014 Global Conference on Civil Service and Personnel Management. Its flagship event is a global conference held in conjunction with the Astana Economic Forum. In its second year, the 2014 conference convened under the theme “Civil Service Personnel Management: Current Issues and Prospects.” Conference attendees participated in workshops as well as conference panels. Workshops were focused on executive effectiveness, compensation systems, and competency development; while conference sessions had presentations from experts and senior government officials from a dozen countries. In attendance at the 2014 conference was ASPA Past President Chester Newland (1980-1981). Newland previously worked in Kazakhstan in the early 1990s following its independence. An expert on executive and international executive systems, Newland shared his knowledge and expertise in this area and commended Kazakhstan’s progress over the last 22 years. Other presentations focused primarily on performance appraisal issues. Presentations ranged from basic performance appraisal processes and strategies to identifying competencies used by different countries in managing and assessing public servants. Another important effort of the Hub is the publication of the International Journal of Civil Service Reform and Practice. The journal, published by The Academy of Public Administration under the President of the Republic of Kazakhstan, provides a platform for research and discussions designed to understand and advance civil service. Two issues have been published and journal editors are currently seeking manuscripts addressing human resource management, civil service reform and training and development. The journal seeks scholarly and practice oriented articles. Articles may focus on specific countries within the region or patterns across the region. Additionally, the journal seeks articles addressing issues from countries outside of the region that would be instructive to civil service reform and practice. Questions and submissions should be sent to by email to Mr. Zhandarbek Moldashev, research fellow of the Academy of Public Administration’s Research Institute, at [email protected]. Upcoming deadlines for issues are July 1, 2014 (Issue 3) and October 1, 2014 (Issue #4). Manuscripts should not exceed 7,500 words, excluding endnotes and bibliography. Manuscripts may be in either English or Russian. Manuscript should include a title page that includes, the manuscript title, author(s) name, affiliation, e-mail address, mailing address, and telephone. Submissions must also include an abstract of no more than 200 words. Citations must follow the social science author-date system in the Chicago Manual of Style or Harvard Style Guidelines. Submissions should be submitted by email as a Microsoft Word file. To view previous issues of the journal visit the Regional hub website http://www.regionalhub.org/en-us/E-Library.aspx or the Academy of Public Administration website http://pa-academy.kz/index.php/en/the-workshop-of-the-regional-hub.